Casa Grande is in an arid desert climate. In January, the normal high temperature is 64 with a normal low of 39. In July, the normal high temperature is 101 with a normal low of 77. Annual rainfall is around 10 inches (250 mm). In the city, the population was spread out with 30.9% under the age of 18, 9.3% from 18 to 24, 26.4% from 25 to 44, 19.6% from 45 to 64, and 13.8% who were 65 years of age or older. The median age was 32 years. For every 100 females there were 97.1 males. For every 100 females age 18 and over, there were 91.5 males. 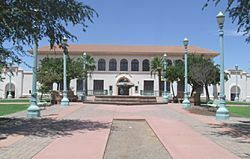 The Casa Grande Municipal Court is the judicial branch of Casa Grande City government and accepted 6,609 filings, conducted 2,486 arraignments and held 156 civil, criminal and jury trials in Fiscal Year 2006-2007. Casa Grande, Arizona Facts for Kids. Kiddle Encyclopedia.